Complete Advanced provides thorough preparation for the revised 2015 Cambridge English: Advanced (CAE) exam. It combines the very best in contemporary classroom practice with first-hand knowledge of the challenges students face. This course provides comprehensive language development integrated with exam-task familiarisation. There are exercises to help students avoid repeating the typical mistakes that real exam candidates make, as revealed by the Cambridge Learner Corpus. This topic-based course covers every part of Cambridge English: Advanced in detail, ensuring that students are fully equipped to tackle each part of every paper. Exam information and Exam advice is offered throughout, culminating in Exam round-up sections which check that candidates know how to approach each paper. The accompanying CD-ROM enables students to focus on their own particular areas of difficulty and work at their own pace. 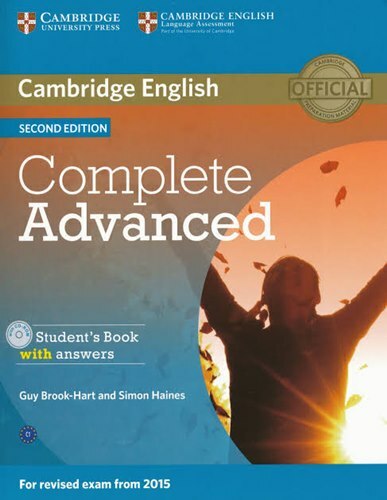 Official preparation material for Cambridge English: Advanced. Provides thorough preparation for the revised 2015 exam. Exercises informed by the unique Cambridge Learner Corpus of real exam candidates' answers help students avoid common mistakes. The comprehensive Teacher's Book with extra photocopiable resources such as tests, wordlists and activities saves on preparation time and provides scope for consolidation and extension. Includes teacher access to a full practice test with audio in order to familiarise students with the exam. The Student's Book CD-ROM gives students the opportunity for extra practice in the areas they need it. Interactive eBooks allow the Student's Book and Workbook to be used conveniently on tablets.